Edmonton Oilers forward Ryan Smyth announced his retirement from the National Hockey League today, in front of family and friends at a news conference at Rexall Place. Number 94 will play his final NHL game tomorrow night against the Vancouver Canucks. The native of Banff, Alberta, will retire after playing 1,270 career NHL games, accumulating 842 points (386G, 456A), 974 penalty minutes, 56 game winning goals and 159 power play goals, including 126 with the Edmonton Oilers, which leaves him tied for the club record with former Oiler Great Glenn Anderson. The veteran left winger is in his 20th NHL season and his 15th season with the Oilers. Smyth has dawned the Oilers sweater for 970 games posting 631 points (296G, 335A), 771 penalty minutes and 45 game winning goals. Smyth appeared in 68 playoff games with the Oilers, recording 43 points (22G, 21A), 76 penalty minutes, three game winning goals and eight power play goals. He played a key role in the Oilers Stanley Cup run in 2006, tallying 16 points (7G, 9A), 22 penalty minutes, four power play goals and one game winning goal in 24 games. The Oilers drafted Smyth in the 1st round, 6th overall, in the 1994 NHL Entry Draft and he made his NHL debut on January 22nd, 1995 at the Great Western Forum against the Los Angeles Kings. He played his first full season with the Oilers in 1995-96 and registered his first career NHL goal on November 24th, 1995 on the power play against the Calgary Flames. 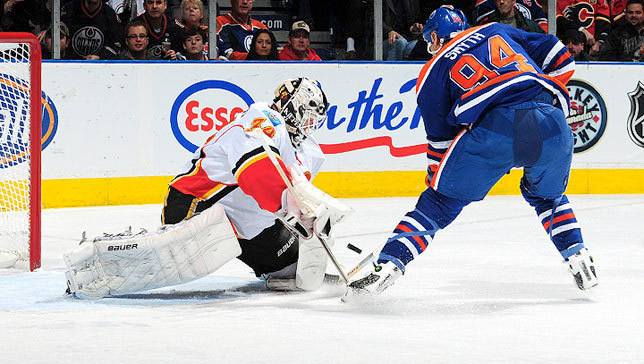 Smyth holds several Oilers’ club records, including the fastest hat trick which was scored in 2:01 on October 12th, 2006 versus San Jose, breaking the previous record held by Wayne Gretzky. 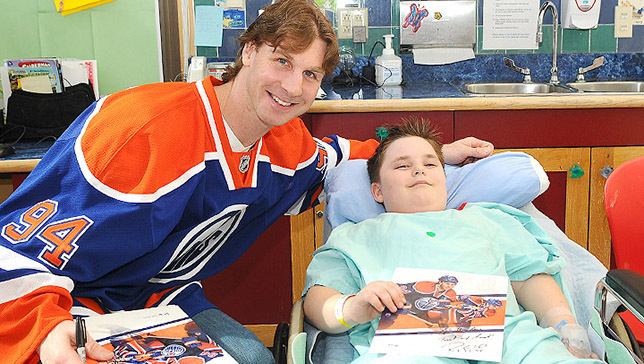 The Oilers recognized Smyth for his community involvement in 2012-13, awarding him the Oilers community service award. He was also voted the Oilers Most Popular Player numerous times (2002-03, 03-04, 05-06) and won the Molson Cup Three Stars Award twice (2003-04, 05-06). “Smytty” ranks in several Oilers all-time leader categories including second in games played (970), sixth in points (631), fifth in goals (296), seventh in assists (335), fifth in hat tricks (5), fourth in game winning goals (45) and first in power play goals (126). The 38-year old Smyth has represented Canada several times internationally, most recently at the 2012 Spengler Cup, where he captained the team to a championship. He is Canada’s all-time leader in games played at the World Hockey Championship and has served as Captain for six Championships (2001-05 and 2010). Captain Canada has won gold on several occasions, most notably the 2002 Winter Olympic Games in Salt Lake City, Utah. Ryan and his family have been very active in the community and continue to support several charities in and around Oil Country. They will continue to reside in Edmonton and be proud supporters of the Edmonton Oilers.